If you’re wondering how to plan a transportation themed birthday party for kids, I’ve got you covered! In all honesty, I decided on a transportation birthday party theme when my twins each wanted different vehicle themes for their birthday. Oh, the challenge of pleasing two people with one birthday! Below is my short list of transportation party ideas. 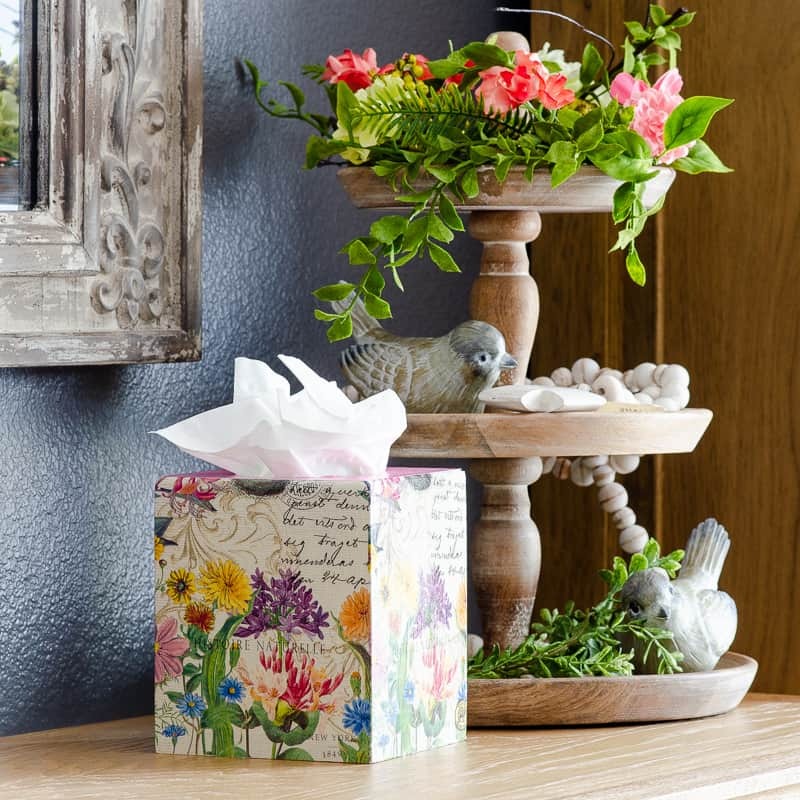 These are sure to please any kid, even twins! Below, I’ve listed my top picks for transportation themed paper goods with planes, trucks, and other vehicles. 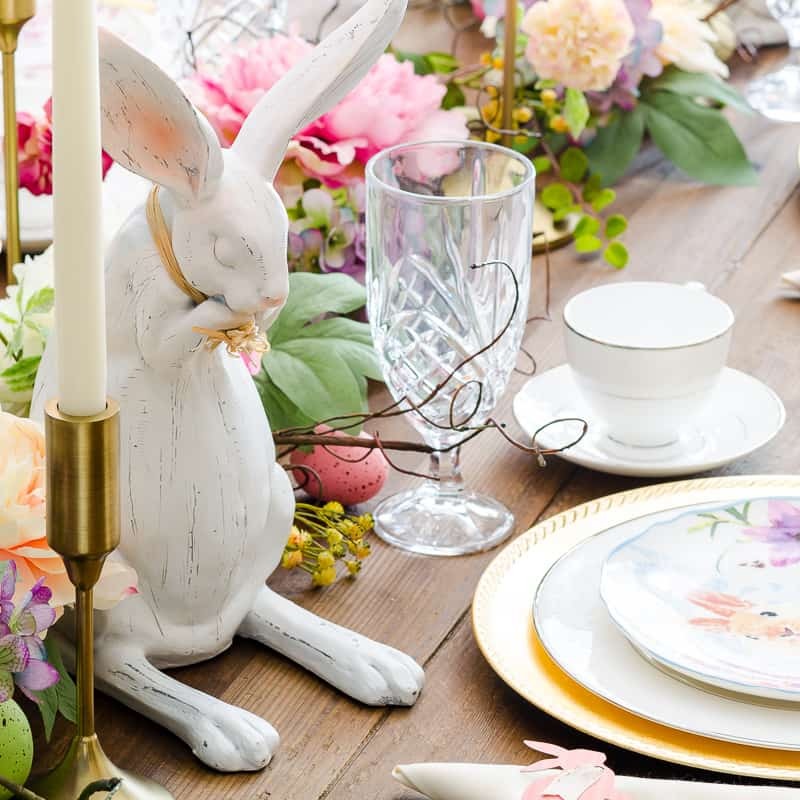 For the boys’ party, I found a great “Traffic Jam” line of plates and napkins that set the color scheme for the party. Fortunately, I already had plenty of plates and utensils in primary colors. I even found leftover red and blue personalized balloons with my kids’ names on them. Score! 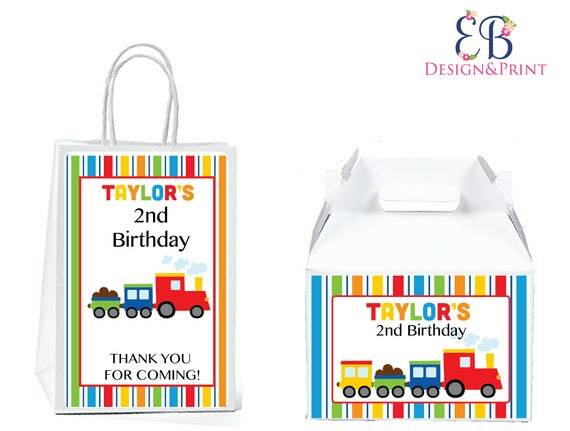 Looking for more personalization for your transportation party? 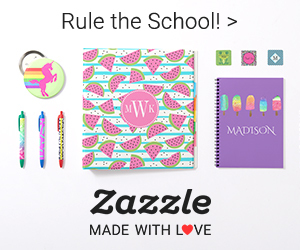 Here are some great finds I selected from Etsy. 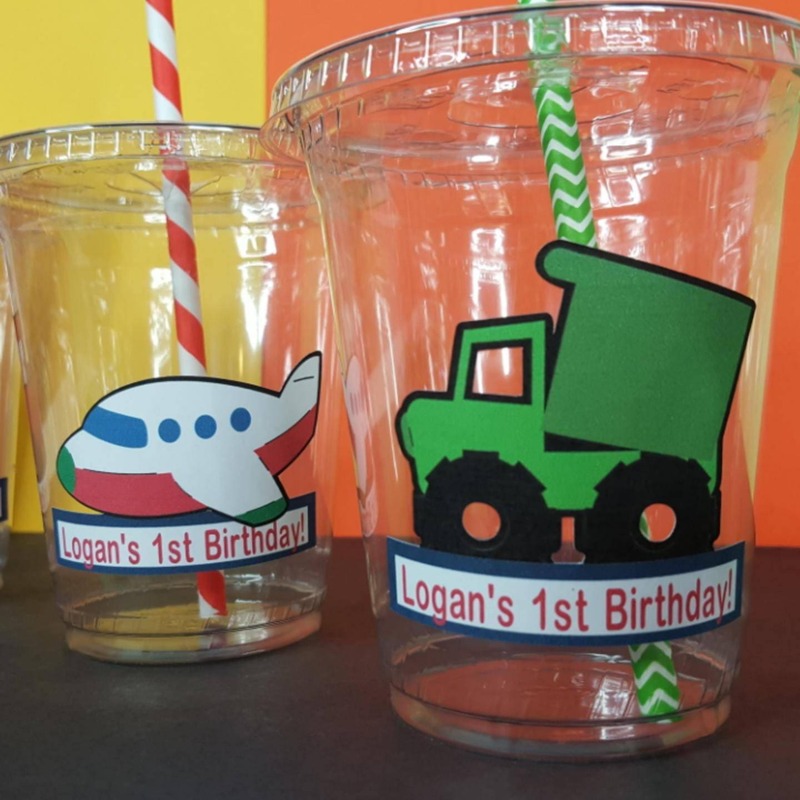 Customize these transportation themed plastic cups for your special birthday boy or girl. 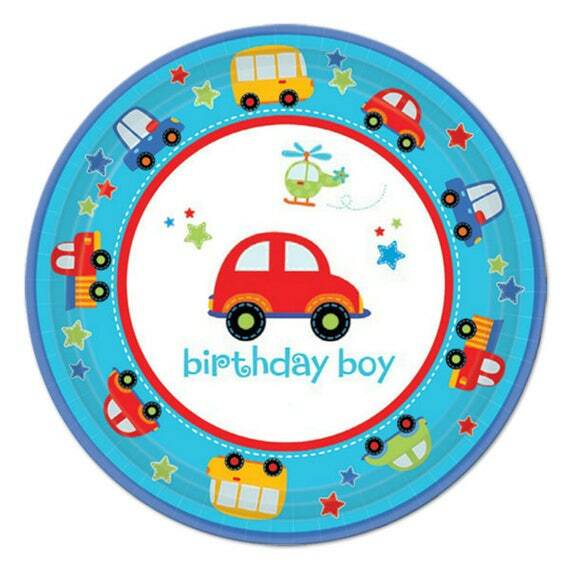 If you need paper goods for a younger child, try these transportation themed plates that have a whimsical feel. You can also personalize this melamine vehicles plate for your guest of honor. Many retailers offer great transportation-themed frosting sheets online if you plan far enough ahead. Since I was pressed for time, I modified a Paw Patrol cake from my local supermarket and added vehicle-shaped candles. Voila! 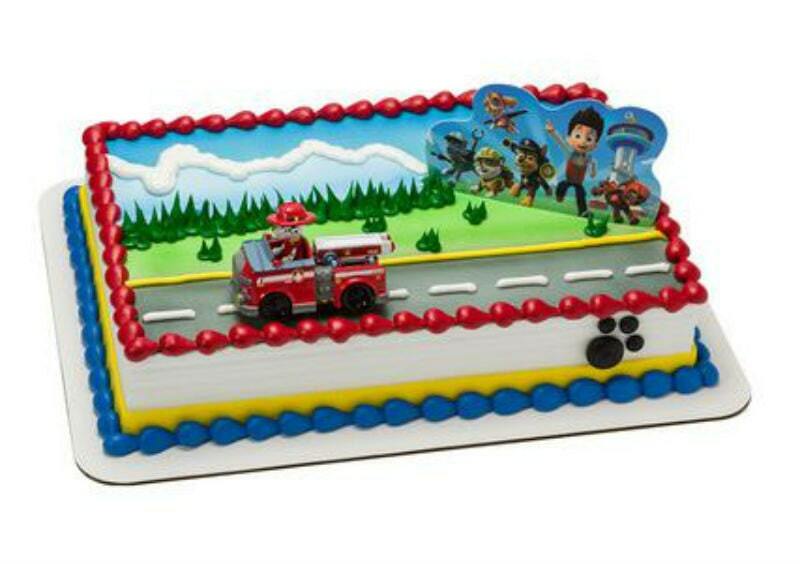 You can order the same Paw Patrol cake I used here. 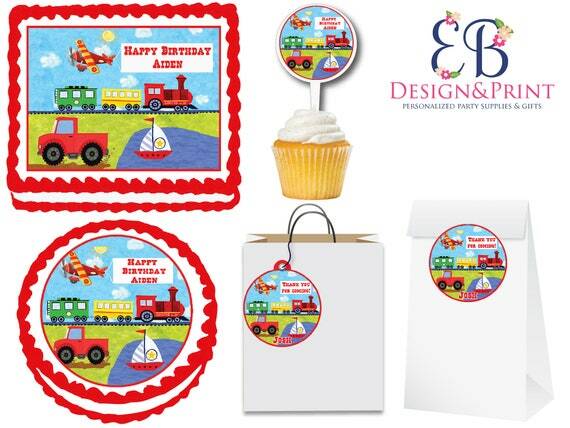 For a more personalized transportation-themed frosting sheet, check out these options that include a plane, train, ship and truck. 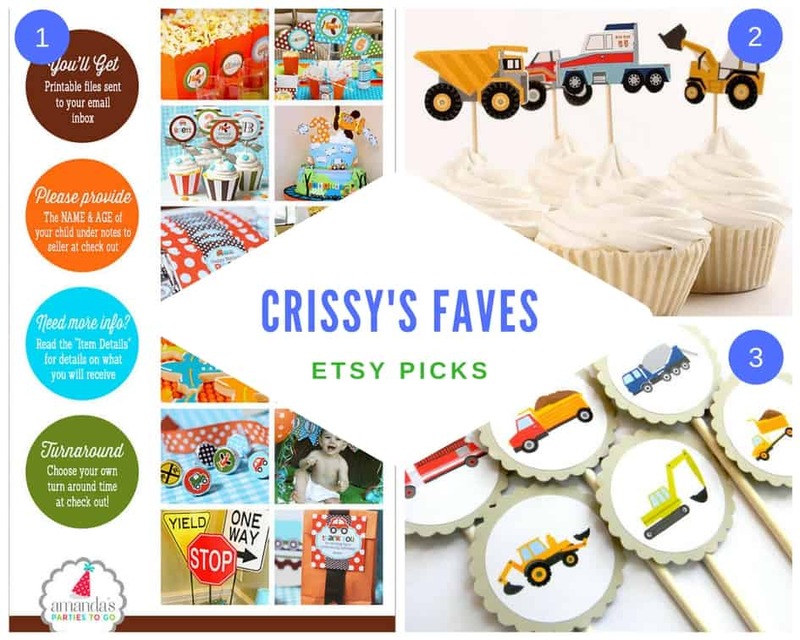 For other transportation cake ideas, see my curated list of Etsy picks below. 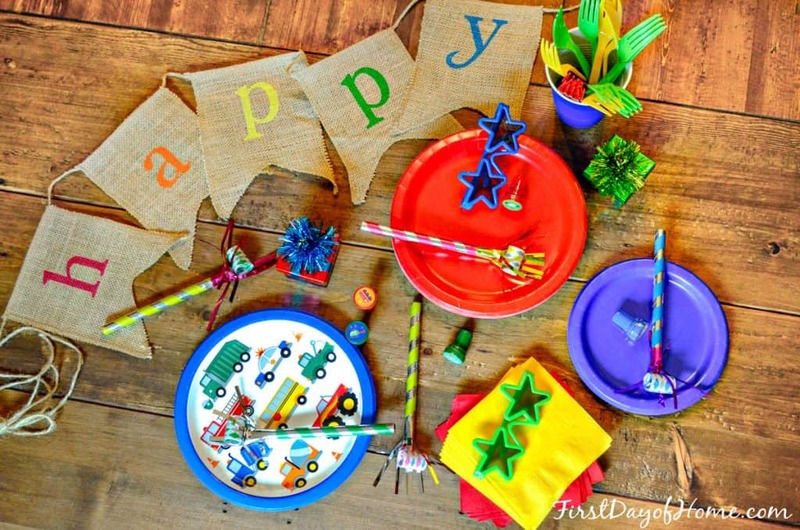 To add a little pizzazz to my sons’ cake, I created a “Happy Birthday” topper using kebab skewers and glitter card stock we had around the house. I’ll soon post a tutorial on how I did that using a Silhouette Cameo. Since I had many blue paper sacks leftover from a Cookie Monster party, I decided to create my own gift bag labels. 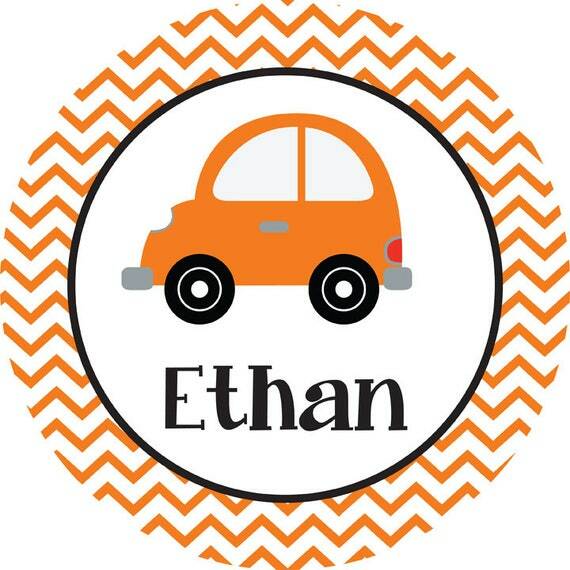 Using card stock and simple truck images I found online, I designed my labels (again using a Silhouette Cameo). Then, I simply hole-punched the top and tied a bow so our little guests could easily open their goodies. Soon, I’ll post a full tutorial on creating your own labels. 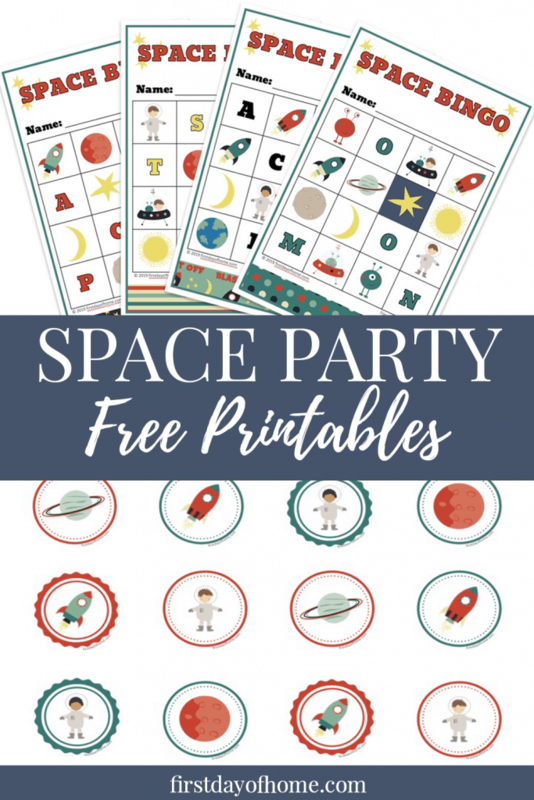 My favorite party favors usually include a few “disposable” items, like stickers, stamps or mini coloring books. We even had enough stickers left over to keep the boys busy during church for many weeks! (Can I get an “Amen”?) 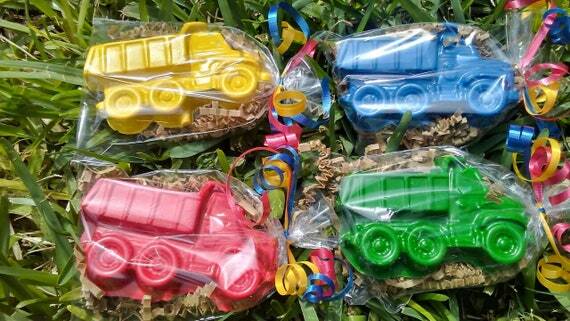 See below for some of my top transportation themed birthday party favors. 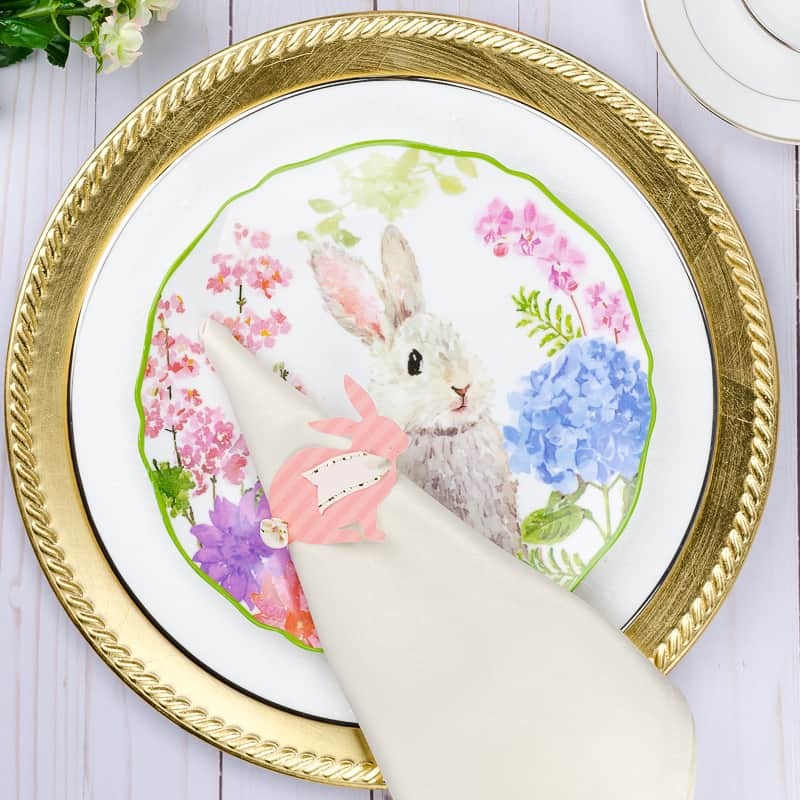 In addition, I found these handmade or customizable party favors you can buy directly from Etsy by clicking the images or links below. 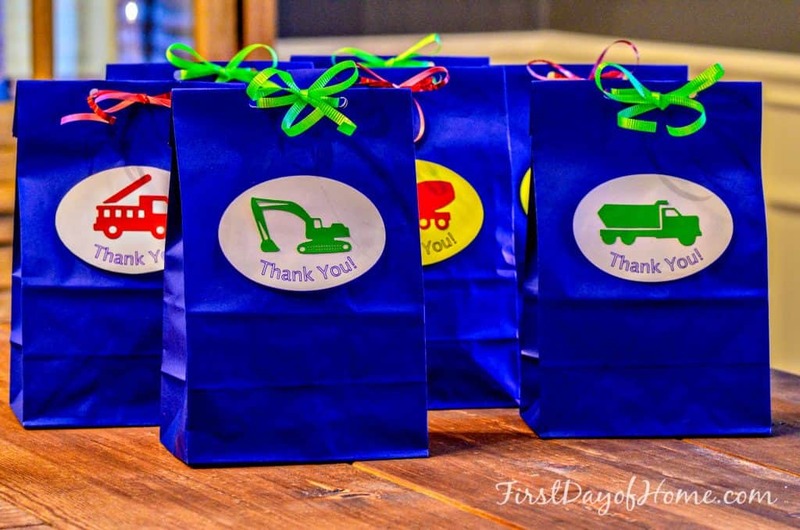 These personalized transportation themed party bags come ready to stuff with favors. 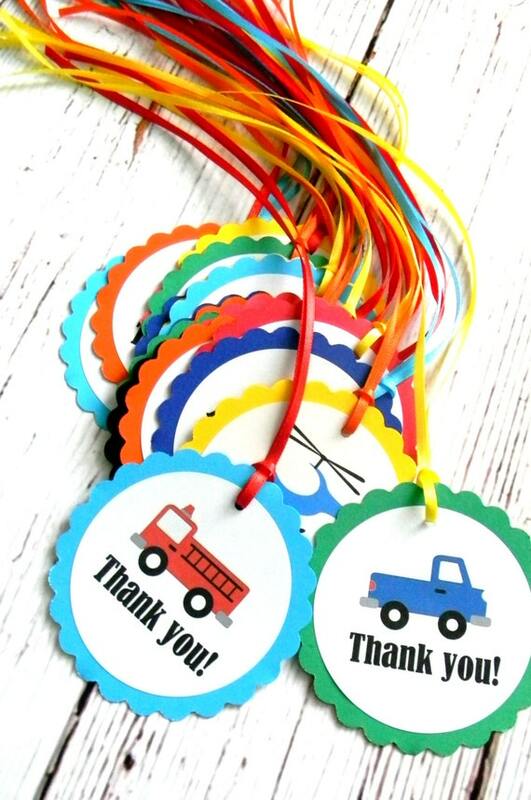 If you need favors in a hurry, grab these transportation party tags that you can attach to any paper bag. I love these crayons shaped like construction vehicles! 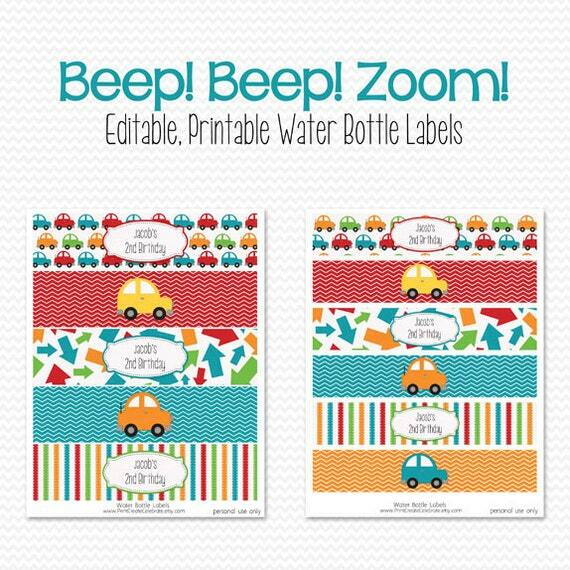 These customizable transportation labels for water bottles would also make a great favor or decorative item for a transportation themed kids birthday. I love making lists, and I’ve planned a lot of parties. 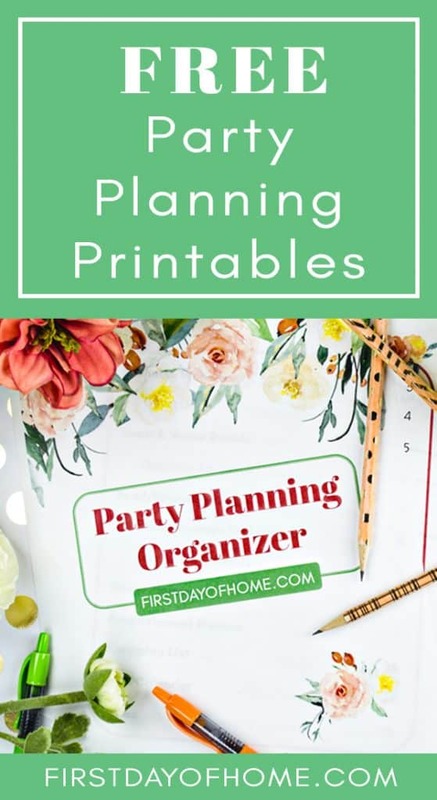 Check out my Free Party Planning Printables for a 15-page organizer that will ease your stress when planning your next shindig. 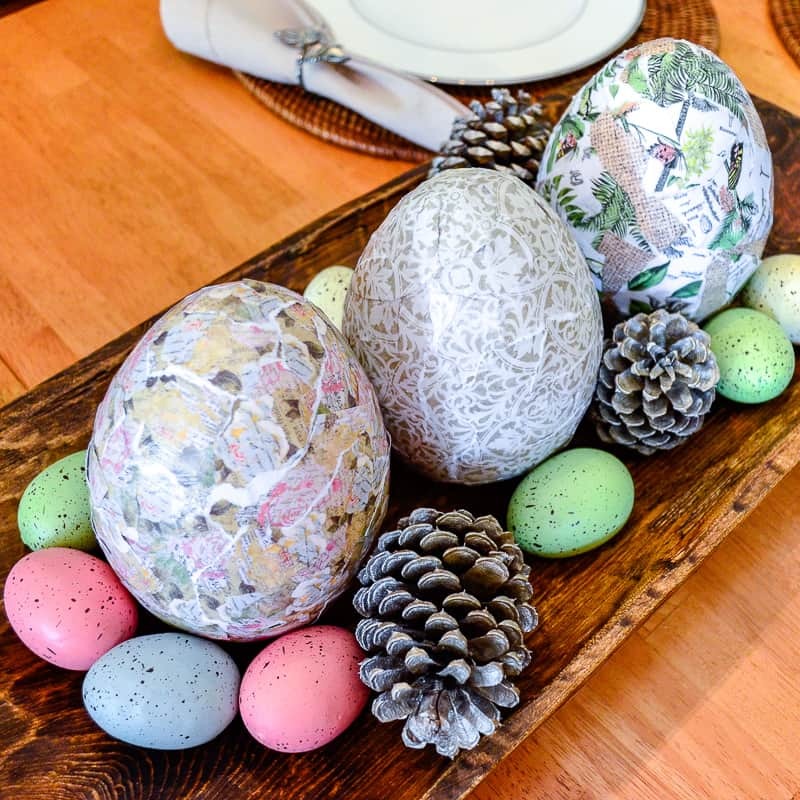 As always, I appreciate you pinning this post for later or sharing it with friends! 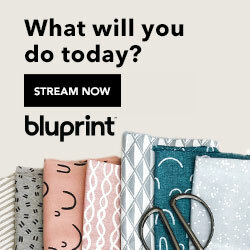 You can also follow me on Pinterest here. Great work! I recently did an “insects” party for my youngest but not nearly so well themed as this! “Insects” sounds like a very cute theme! 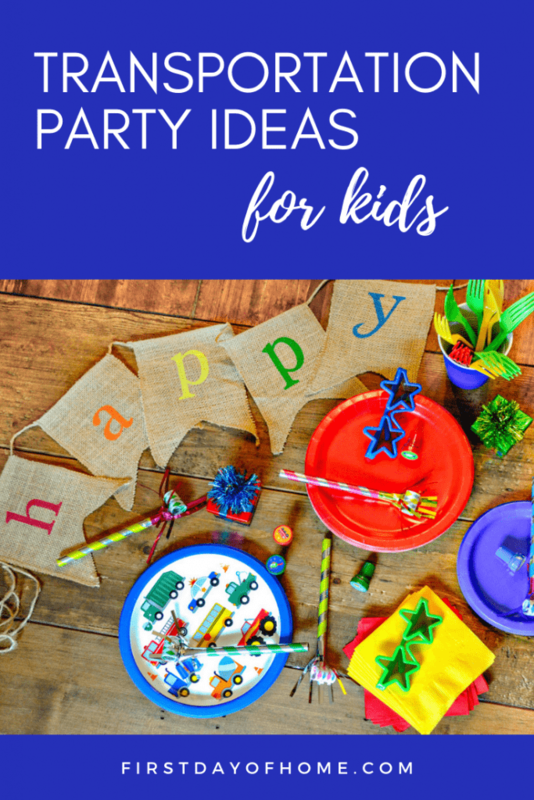 I’m collecting dinosaur party ideas on my Pinterest page. Who knows if my boys will go for that, though!